Marisa & Carson included me in every aspect of their engagement season, and it was such a sweet gift to be a part of so many cherished days with them, from their engagement session at Furman University to Marisa’s bridal session at Ritchie Hill in Charlotte, their Rehearsal Dinner at the Poinsett Club, and finally their wedding day at the Westin Poinsett, Furman’s Daniel Chapel and Revel. Plus – I also photographed Carson’s brother’s wedding (Sydney & Sam) in May, so I just absolutely felt like part of their family by the end of this great weekend and it was so fun to see them again as newlyweds and gaining new siblings! These two met in grad school when they were assigned to sit together (how cute is that? 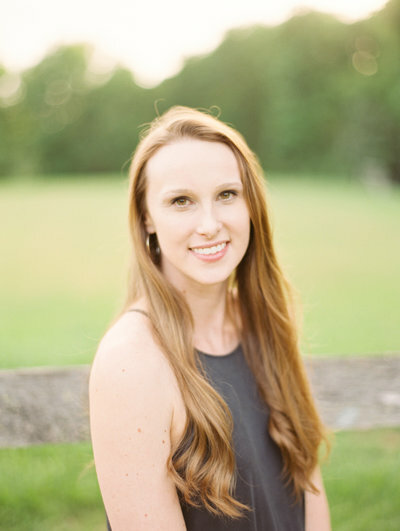 ), and a few years later are now both working in the medical field and living in Charlotte with their golden pup, Remi – who made an appearance both at their engagement session and on the wedding day! Marisa & Carson’s good friends actually drove Remi up on a golf cart to the Westin to have some portraits taken with them, and it was one of the funniest/best things about this day (scroll below for a fun behind the scenes of this!) 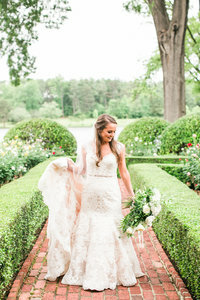 I am still slightly obsessed with Marisa’s gorgeous Hayley Paige lace gown, and both first looks with her dad and Carson were probably my favorite moments of the day. 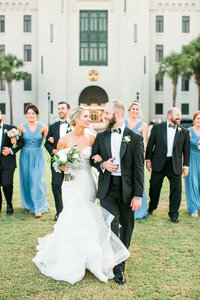 I died in the best way over their beautiful bride & groom portraits outside (both at the Westin and at Furman), and the Daniel Chapel is always a gorgeous location for ceremonies. I asked the bus to take us over to the bell tower after the ceremony and we hopped out and shot some sunset portraits for just the two of them in about 10 minutes, easily my favorite part of the day! This light, y’all! And you’ll also see a photo of sweet Carson fluffing out his bride’s veil. 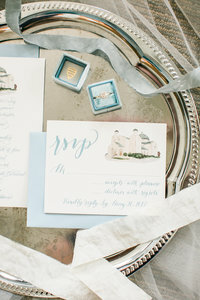 Revel was the perfect venue for their reception, with so many beautiful details – candlesticks, eucalyptus and linen runners at the wooden high top tables, blue & white patterned linens, a greenery install in the chandelier, white drapings and lighting all brought together by the talented & sweet Kelley of Clink! Events! Their band kept everyone dancing & singing all night, chickfila was served as a late-night snack (yes please), they got to love on all their people and left in a grand sparkler exit. What a day!